Stockholm is like no other capital in the world. Built on fourteen islands, it rises gracefully from water so clean that you can go swimming or fishing in the very heart of the city. Its waterfront is alive with boats, from ferries to shuttle you around the city to sailboats and yachts that cruise out into the vast archipelago that stretches into the Baltic. Of course getting around doesn't require a boat--you can walk, bike, drive or take advantage of the city's impeccable mass-transit system. The history of Stockholm dates back to the 13th century, and the best place to discover it is in Gamla Stan, the Old Town. Gamla Stan is famous for its winding, cloistered streets, boutiques, and cozy restaurants, all gathered close by to the Royal Palace. An hour's boat ride brings you to the gardens of Drottningholm Palace, the pastoral residence of Sweden's Royal Family. Within the graceful architecture of this historic capital you will discover a cultural life of exceptional vitality and energy. Hundreds of restaurants of varying taste and style are found here, as well as innumerable shops and galleries showcasing the works of Stockholm's exceptional arts community. Music in the city ranges over all types, from folk dancing in the parks and summer jazz festivals and classical concerts to Swedish and American pop and rock. In a metropolitan area with well over a million people, you can escape the crowds--to a quiet beach, a lush forest, or even a deserted island if you like--sometimes in as little as half an hour. Or you can join the crowd, perhaps in the park for free aerobics classes. Stockholm Grand City Tour, Stockholm City Hop-on Hop-off Boat Tour, The Stockholm Card, Under the Bridges of Stockholm and many more. Designed by Ragnar Östberg, Sweden's most renowned architect, this striking building contains over eight million deep red bricks and 19 million gilded mosaic tiles. Completed in 1923, it is host to the Nobel Prize banquet each December. Stockholm's Old Town is located on a small island in the very heart of the city. Within its bounds are a multitude of historical sights, including the Royal Palace, the Parliament, and the House of Nobilities, as well as the world's most long-established bank, the Bank of Sweden, founded in 1656. The world's oldest restored warship, Vasa, is on exhibit at its new museum on the island of Djurgården. She capsized moments into her maiden voyage in 1628 and was salvaged 333 years later from the sea floor. The Vasa Museum is one of the most popular sights in Scandinavia. The most popular section of this vast and unbroken expanse of nature within the city is Djurgården, which houses the Vasa Museum, Skansen, and more. Known for its collection of folk art, peasants' local costumes, and Sami art, the Nordic Museum mounts frequent exhibits of Swedish cultural life since the 16th century. This impressive underground exhibit features some of Sweden finest golden treasures from all eras of history. Roman coins can be found alongside deftly wrought Viking bracelets and brooches. There are over 3,000 objects in all. Established in 1891, Skansen is the world's oldest open-air museum. It holds 150 authentic, age-old houses from all regions of Sweden, including windmills and a church, in which wedding ceremonies are still held. All major Swedish festivities are celebrated here, and both visitors and locals can join in the fun. Home to the Swedish Royal Family, Drottningholm is located on an island in the outskirts of Stockholm. The palace is famed for its beautiful situation, its well-tended parks, and the unique Drottningholm Theater, which is the world's best-preserved 18th century theater. For all its wonderful castles and museums, restaurants, shops and night life, no trip to Stockholm is complete without at least a short excursion to the archipelago. It consists of 24,000 islands, from big to small, some inhabited, others large enough for only a smattering of wildflowers. In the nineteenth century the archipelago became a favorite retreat for the wealthy and famous, who began to build summer residences here. More recently the archipelago has become an experience shared by people from all walks of life--during the peak summer months the area's 10,000 permanent residents are joined by weekenders and vacationers from the city, who fill the cottages and homes of the islands and the pleasure boats that cruise the waterways in between. Day trips to the larger islands of the archipelago can be made by car or bus; however, to see the islands at their best requires a boat. There is a wide variety of scheduled and charter boats available, most departing regularly from downtown Stockholm outside the Grand Hotel. Some are "jazz and shrimp" evening cruises. If you love sailing, you might consider renting your own boat; however, if you are in Stockholm for only a short stay the best mode of travel is by steamship, especially one of the authentic century-old steamers. Among the few ships of their kind still in operation, these grand vessels offer a trip into the graceful travel of the past as well as the captivating beauty of the archipelago. Exploring the archipelago thoroughly could take a long, pleasant lifetime. For those on a more limited schedule, however, here are a few of the more enchanting ports of call. This conveniently-located little cluster of islands is a favorite excursion for Stockholm residents, who come to meander among its historic buildings, its small shops and restaurants, and its bustling harbor area. Fjäderholmarna's fine aquarium is especially popular among the island's younger visitors. For many, the island of Vaxholm typifies the attractions of Archipelago life, from the intimate scale of the harbor town to the striking natural beauty of the island itself. Vaxholm island is situated astride what used to be the primary waterway from the Baltic to Stockholm, and so its exceptionally picturesque harbor is graced by a brooding 16th century fortress. Now a museum, the fortress houses exhibits chronicling the history of life in the Archipelago as well as displaying an extensive collection of weaponry, maps, and other materials related to its own colorful history. Set on the verdant island of Björkö, Birka is a town with a fascinating historical and archaeological heritage. 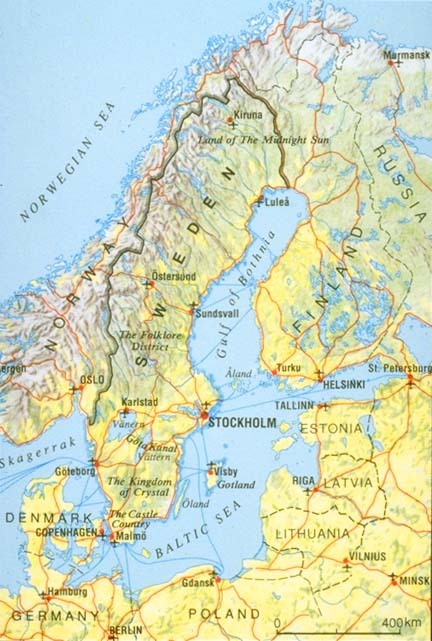 It was Sweden's first sizable community, having established substantial trading links with Europe more than 1,200 years ago. Today Birka is a UNESCO World Heritage site, and its past has been brought alive in the recently-opened Viking Museum, which offers visitors a glimpse into everyday living conditions in Birka more than a millenium ago. This diminutive community, with a year-round population of less than 150, is best known as the host of one of Sweden's biggest sailing events-the Round Gotland Race. Sandhamn's skyline (if a village can be said to have a skyline) is dominated by the signal tower of the Royal Sailing Club (KSSS), which occupies an 18th-century custom-house. Around the KSSS are the town's tiny, closely-built houses, shops, and restaurants. Copyright (c) 1997 - 2008 interKnowledge Corp.